The International Conference on Spatial Information for Sustainable Development, held in Nairobi, Kenya 2-5 October 2001, was organized by the Institution of Surveyors of Kenya, the International Federation of Surveyors (FIG) and the UN-Habitat. The conference became a reality because of support and help from the main sponsors United Nations Environmental Program (UNEP), GEOMAPS Ltd. Surveying and Mapping and Institution of Quantity Surveyors of Kenya, the co-sponsors Metrocosmo Valuers Ltd, University of Nairobi, Intergraph Mapping and GIS Solutions and Swedesurvey AB and a number of companies and institutions who have contributed in one way or another. In addition the United Nations Economic Commission for Africa and United Nations Food and Agriculture Organization were active participants /C1/. Spatial Data Infrastructure and Spatial Information Management is clearly in the focus for all surveyors and other stakeholders worldwide in their diverse tasks in development, planning and resource management and in their efforts at creating and supporting a Sustainable Development. The conference offered the speakers as well as the participants the opportunity to focus on, discuss and share experiences on issues and topics related to Spatial Information for Sustainable Development in general and in Africa in particular. The conference concentrated on the following sub-themes: i) Spatial Data Infrastructure and Spatial Information Management, ii) the role of Spatial Information in land tenure, land administration and spatial planning iii) low cost housing and iv) Spatial Information, education and best practices. The outcome of the Conference is a number of recommendations on actions necessary for establishing a Spatial Data Infrastructure. This publication, which includes the conference recommendations, is intended to support politicians, senior managers and professional organisations by providing greater understanding of the need for Spatial Data Infrastructures (SDI's) and how they can be used to support Sustainable Development. Even though the recommendations are based on African conditions they are easily transformed to general terms are therefore applicable to all regions of the world. Strengthen and promote the relevant information to support FIG Agenda 21. The conference recognized, against a background of presentations and discussions and the outcome from other international conferences, workshops and taskforces, that development and implementation of a National Spatial Data Infrastructure is a prerequisite for promoting Sustainable Development. The conference also recognized that although every National Spatial Data Infrastructure (NSDI) is different due to a variety of cultural, social and economic factors unique within each country, there are a significant number of common elements that can be shared. It is recognized that a key success factor of implementing NSDI is the management of information as an asset, as in the case with finance and human resources. Mature NSDIs are complex solutions involving a number of stakeholders. However, those who have a NSDI have started with clear short-term objectives and corresponding simple solutions. The use of Spatial Information to support Sustainable Development will only be achieved if solutions start with realistic objectives and grow incrementally through political and market needs. Many of the key infrastructure requirements of NSDI, e.g. pervasive telecommunications and internet access are not widely available in some countries, this limits the applicability of leading edge NSDI technical solutions. Vendors are encouraged to understand the needs of developing countries and design and market appropriate technical solutions. 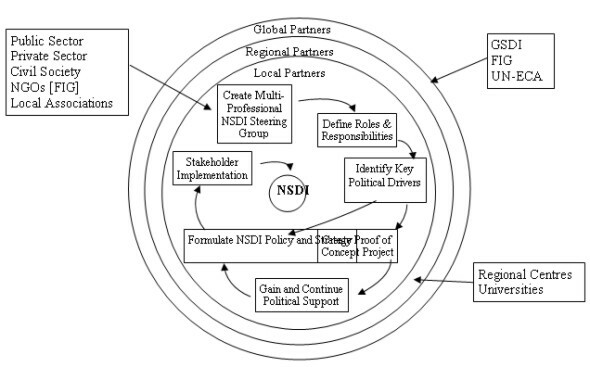 NSDIs are underpinned by effective partnerships and co-operation amongst a wide variety of multi-disciplinary stakeholders in public and private sectors and the end user communities. Countries are encouraged to form appropriate policy and institutional frameworks and facilitate co-operation amongst stakeholders. The creation of a 'proof of concept application' can be used to gain and continue political support whilst feeding into the formulation of NSDI policy and strategy. African countries are encouraged to form National NSDI Steering Groups to formulate appropriate policy and institutional frameworks and facilitate co-operation amongst the stakeholders. African countries are encouraged to design solutions that start with realistic objectives and grow incrementally through political and market needs. African countries are recommended to establish regional co-operation through joint initiatives that require regional information management to support common interests. The Commission on Developing Information (CODI) proposal for UN-ECA to establish a Permanent Committee for NSDI in Africa is strongly supported. This publication, which includes the conference recommendations, is intended to support politicians, senior managers and professional organisations by providing greater understanding of the need for National Spatial Data Infrastructures (NSDI) so that Spatial Data and Information can support the implementation and maintenance of Sustainable Development effectively. A major part of data and information necessary for Sustainable Development refers a particular geographical location somewhere on the Earth. Data and information with a reference to a specific location is called Spatial Data and Spatial Information respectively. Spatial Data and Information is strategically important to decision makers at all levels as it affects a major part of all human decision-making. The information requirements for supporting Sustainable Development involve the integration of a number of different types of data from diverse sources, including: land administration, socio-economic, environment, and development. Through common spatial referencing standards enforced by NSDI, these data can be interchanged and integrated to encourage a more holistic approach to decision making involved in Sustainable Development. The information requirements for managing Sustainable Development require datasets to be available locally, nationally, regionally as well as globally. There is therefore a need to create a 'vertical information highway' to allow transaction based information to be generated through administrative activities at the local level, e.g. land registration, to be aggregated through the local - national - regional and global levels. This approach to recycling information through different levels of Spatial Data Infrastructures will ensure that datasets are current and compatible. The Spatial Data Infrastructures can be the 'land information engine' to support this vertical information highway. Mature NSDIs are complex solutions involving a number of stakeholders. However, those who have a NSDI have started with clear short-term objectives and corresponding simple solutions. The use of Spatial Information to support Sustainable Development will only be achieved if solutions start with realistic objectives and grow incrementally through political and market needs. The concept of Sustainable Development is much more than "protection of our environment". It has essential social and financial dimensions and the fundamental principle to secure decent conditions of life for the future generations must never be forgotten. It is our duty to promote a Sustainable Development. We need to be considerate and we need to have a breadth of view. We can form a general view by monitoring the development and continuous analyse the results. Information technology is indispensable but Spatial Data, Information and Knowledge is a prerequisite. Spatial Information and Knowledge Management will be in focus in the years to come. Spatial Information Managers and responsible politicians will become the main catalysts in the development, implementation and maintenance of the necessary Spatial Data Infrastructures. Guidance to the reader: Chapters 3-6 provide an introduction to Sustainable Development, Spatial Data and Information, Spatial Data Infrastructure and some related international events. Further details about these topics are available in Appendix C. Chapter 7 contains the recommendations. References to literature and links are in Appendix A. The outcome of the Commission 3 Annual Meeting 2000 is in Appendix B. Development is the managed process of change designed to improve the conditions of members of a society. Sustainable Development implies that this process should balance the exploitation of resources, the direction of investments and the advancement of technology in a manner that affords the same opportunity to future generations /C2/. 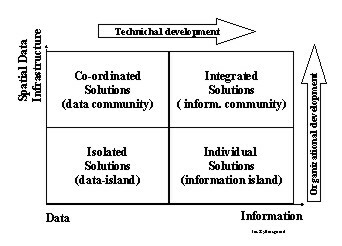 Rethinking of both inter-organisational and intra-organisational relations in order to improve the use of common data and the reuse of data. Almost all objects like roads, lakes, rivers, settlements, pollutions, citizens, etc, in our environment have a reference to a specific location, called a spatial reference. In the same way every change in or influence on our environment has a reference to a specific location. The spatial reference is a "main key" in the transformation of data into information. Often the lack of availability, quality and coherence, means that the standardization and accessibility of spatial data is a serious hindrance for this transformation, and in that way a barrier for the implementation of Sustainable Development. Spatial Data and Information is an indispensable part of the basic infrastructure of an individual country, as are roads, hospitals and schools. Spatial Data and information is strategically important to decision-makers at all levels. Like other infrastructure elements the establishment and maintenance of data implies high costs and lengthy implementation time. Unlike other resources, Spatial Data does not suffer any wear and tear from repeated use. Reusing of data increases the possibilities for improving the quality of the content of data collections. The real benefit of investments in Spatial Data increases dramatically with the multiple use of data. Provided that data are based on a common spatial reference system with Geographic Information Systems (GIS) it becomes possible to integrate, analyse, model and visualize spatial data from the different sources on the local as well on the national and international level. Management of Spatial Data, Information and knowledge is a key element in the processes which lead to users of Spatial Data and Information having a better overview of both simple and complex problems and which give users the possibility to create comprehensible and thus acceptable solutions and/or compromises. Consequently Spatial Information and Knowledge Management becomes an important discipline in both developed and developing countries and in countries in transition. In 1994 the Federal Geographic Data Committee defined a National Spatial Data Infrastructure (NSDI) as: the technology, policies, standards, and human resources necessary to acquire, process, store, distribute, and improve utilization of geo-spatial data /www.fgdc.gov/. The information requirements for managing Sustainable Development require datasets to be available locally, nationally, regionally as well as globally. There is therefore a need to create a 'vertical information highway' to allow transaction based information to be generated through administrative activities at the local level, e.g. land registration, to be aggregated through the local - national - regional - global levels. This approach to recycling information through different levels of Spatial Data Infrastructures will ensure that datasets are current and compatible. Dissemination, modelling and visualization are based on international standards. In 1999 the FIG Commission 7, in close cooperation with UN organisations and the World Bank, held the workshop on "Land Tenure and Cadastral Infrastructures for Sustainable Development" in Australia. The outcome of the workshop, "The Bathurst Declaration on Land Administration for Sustainable Development" /5/, is primarily devoted to issues relevant for the administration of land. The declaration points out the need for Spatial Data and Information, and the need for a land information infrastructure. A land information infrastructure is a subset of a Spatial Data Infrastructure. In 2001 the FIG General Assembly adopted the proposal "FIG Agenda 21 - Agenda for implementing the concept for Sustainable Development in the activities of the International Federation of Surveyors and its member associations" /6/. The main findings call attention to the fact that promotion of Sustainable Development demands formulation of a Spatial Data Infrastructure. In 2001 the United Nations arranged two regional conferences addressing topics related to spatial information /C6/. The Seventh United Nations Regional Cartographic Conference for the Americas was held in New York 22-26 January 2001 /7/ and /11/. That all countries of the Americas embrace the concept of NSDIs and develop implementation strategies that support regional and global SDI initiatives while meeting national objects. The Development Services Division of UN-ECA had prepared a position paper: "The Future Orientation of Geoinformation Activities in Africa" /9/. The aim of the paper was "To raise awareness of African governments on the importance of geographic information…". The paper, which contains very valuable information about and examples on topics related to Spatial Information was endorsed by the meeting. That regional SDIs should be established to meet the wish for regional applications. In the light of the recommendations from international and regional conferences, workshops and task forces it was obvious to focus the outcome of the Nairobi Conference on how to implement Spatial Data Infrastructure on national and regional levels. The recommendations are based on the different presentations, on the results from the discussions in plenary and on experiences from former Commission 3 activities /B/. The recommendations are designed to provide a practical way forward to create a National Spatial Data Infrastructure to support Sustainable Development. In addition two FIG specific recommendations are formulated. The inter-relationship between the recommendations is shown in the figure below. National Spatial Data Infrastructures (NSDIs) are underpinned by effective partnerships and co-operation amongst a wide variety of multi-disciplinary stakeholders in the public and private sectors and the end user communities. African countries are encouraged to form National NSDI Steering Groups to formulate appropriate policy and institutional frameworks and facilitate co-operation amongst the stakeholders. These National Steering Groups should involve end user representation. Experiences from those countries that have embarked on the NSDI process indicate that roles and responsibilities amongst the stakeholders are clarified at an early stage. African countries are recommended to clarify the lead role and the responsibilities and roles amongst the other stakeholders - this will be an initial activity of the National NSDI Steering Group. It is recognised that the rapid implementation of a NSDI must embrace all available resources within a country. This will be best achieved through partnerships between the public and private sectors. Countries are encouraged to involve all sectors in implementing a NSDI and ensure that appropriate business models are agreed to support these partnerships at an early stage. It is recognised that every NSDI is different due to varying cultural, social and economic contexts within each country. However, there are a significant number of common elements that can be shared. Countries should avoid re-inventing these common elements. It is recognised that complete policy and institutional frameworks do not have to be in place before implementation of a NSDI can begin. It is recommended that a top down approach is combined with a pragmatic bottom up approach. Short term bottom up projects will provide valuable experience and through proof of benefits, convince further funding of NSDI. It is recognised that a mature NSDI will be a complex solution involving a large number of stakeholders and user groups. From experience the most effective examples of NSDIs are those that have started with clear short term objectives with corresponding simple solutions. The success of a NSDI is dependent upon delivering products and services that are accepted and desired by the end users, both within Government and the private sector and citizens. This key objective will only be achieved if the requirements are clearly understood. African countries are encouraged to provide for end user needs and ensure that appropriate products and services are provided. It is recognised that a key success factor of implementing a NSDI is the management of information as an asset, as is the case with finance and human resources. Countries are encouraged to adopt information as an asset and manage it appropriately, e.g. only capture data that is needed and can be maintained. A NSDI requires a culture of data sharing to exist within a country. Although data may be accessible for the common good, the organisations providing data must in return receive a benefit for their contribution. It is recommended that countries research the benefits associated with data sharing to encourage wide participation. It is recommended that all countries establish unambiguous naming conventions as a key component of their NSDI, following the guidelines produced by the UNGEGN. Experience has shown that issues associated with national security, data privacy and associated liability are potential show stoppers for NSDI initiatives. African countries are recommended to establish legal frameworks to address these crucial legal issues as early as possible. African countries are encouraged to formulate appropriate legislation to facilitate access to NSDI information and services by the citizen. It is recognised that the benefits of an NSDI are significantly increased if it supports both niche and mass markets. African countries are encouraged to ensure that the appropriate legislative business frameworks are established to facilitate support of mass markets. National organisations, with the support of FIG and sister organisations, are encouraged to organise regular Regional workshops to raise awareness and knowledge sharing of Spatial Information Management for Sustainable Development issues and solutions. This will be a significant contribution to capacity building. African countries are encouraged to provide continuous capacity building. If this is applied at the management level then this will be a significant contribution to institutional building. It is recommended that African countries establish regional co-operation through joint initiatives that require regional information management to support common interests. This will encourage knowledge sharing and ensure common standards are implemented. It is recommended that existing regional centres of excellence in Spatial Information review their current services in the context of the NSDI agenda and ensure that appropriate services are provided to encourage the establishment and support of NSDIs. Universities within Africa should be encouraged to work with the local survey associations in the provision of Continuing Professional Development. The Permanent Committee for NSDI in the Pacific and South-East Asia has been successful in promoting co-operation amongst the participating nations. It is recommended that a Forum of Education and Training is established as a sub-group under the Permanent Committee for NSDI in Africa focussed on the sharing of Education and Training resources and experiences. Land administration in Africa faces specific, but common elements, e.g. variety of indigenous right, informal settlements, in relation to statutory tenure arrangements. It is recommended that African countries share knowledge and experiences and develop guidelines within the framework of UN-ECA by the creation of a Forum of Land Administration as a sub-group of the Permanent Committee for NSDI for Africa. Land administration systems provide important foundation data for NSDI. The Forum of Land Administration is recommended to identify the institutional and operational conditions for successful land administration in Africa. As land tenure in Africa is varied, a good understanding of the concepts of land tenure and its impact on registration is important. The Forum of Land Administration is recommended to aim for a concerted research effort on this subject. It is recognised that ISO (www.iso.org) and the Open GIS Consortium www.opengis.org produce data and interoperability standards that should be adopted by NSDI stakeholders. It is recommended that UN-ECA produce best practice guidelines providing NSDI implementors with practical advice on how to effectively implement these essential standards. It is recognised that the majority of NSDI implementors within Africa have limited opportunity to be exposed to the technical options available to build NSDI. Vendors are encouraged to support a new approach to technology transfer in Africa. It is recognised that many of the key infrastructure requirements of NSDI, e.g. pervasive, effective telecommunications and Internet access, are not widely available in Africa. This limits the applicability of leading edge NSDI technical solutions in Africa. Vendors are encouraged to understand the needs of African countries and design and market appropriate technical solutions. There is a need for co-operation by FIG (www.fig.net) Ad hoc Commission on construction economic and management with other international and regional cost management associations, for research into cost management and community based driven organisational models for low cost housing and the publication of the results for dissemination. There is a need for FIG to establish a Cross Commission Working Group to harmonise land management and planning issues with construction and cost management of low cost housing delivery with holistic requirements and within the framework of FIG Agenda 21. /1/: Al Gore: The Digital Earth: Understanding our Planet in the 21st Century. Given at the California Science Center, Los Angeles, California, on January 31, 1998. /2/: The Longman Dictionary Of The English Language. Harlow, UK. Longman. /3/: Jes Ryttersgaard: Spatial Information Management Supporting Sustainable Development, Proceedings from Commission 3, The FIG Congress in Brighton, England. 1998. /4/: Jes Ryttersgaard and Stig Enemark: From GIS to Geographic Information Management, Organisational and Educational Impacts. GIS/LIS For Sustainable Development - GIS/LIS For The Future.FIG Commission 3 Seminar, 28 - 30 October 1996, Copenhagen, Denmark. National Spatial Information Infrastructure (NSDI) is an Asset for all Nations in general. It should be considered as a key part of wider infrastructure assets such as roads, telecommunication networks etc. Establishing of a Spatial Information Infrastructure demands co-operation/partnership between the public and the private sectors and amongst the variety of professions involved. Given the complexity of existing institutional structures, one can expect conflicts when seeking co-operation in NSDI strategy formulation and implementation. NSDI can proceed even if a formal policy document [top down approach] does not exist. It is possible to proceed with certain operational level activities [bottom up approach] while the policy is being formulated. These activities can themselves drive and encourage policy. Every NSDI will be different, depending on cultural needs, social evolution, economic reality and national ambitions. The environmental framework and the market demand will shape the most appropriate SDI. NSDI policy must be flexible to address rapidly changing needs and wishes of the users and adapt to changing technologies. Varied applications and services through a project oriented approach will bring reality to the NSDI (GSDI). An over emphasis on data acquisition, without a market linked application, will not provide any momentum for further development. The potential values and benefits have to be demonstrated through large scale projects to encourage further investment. Currently, it is often difficult, or even impossible, for users to sensibly combine data from different sources. It is essential that users are involved in defining and testing the associated products and services. Visualisation, modelling and analysing activities will be the focus of value added services in the years to come. Cadastral, topographic and thematic datasets should adopt the same overarching philosophy and datamodel to achieve multi-purpose data integration, both vertically and horizontally. To be able to integrate and share data we need to focus on research to understand and resolve different semantics in data. Alternative possibilities for the presentation and interpretations of spatial information, including integration of knowledge, should be considered. The commercial and contractual frameworks for co-operation and the associated business models will be key issues in the further development of NSDI. To be able to adapt to the e-market rethinking of pricing, rights and access to data is necessary. The International Conference on Spatial Information for Sustainable Development, held in Nairobi, Kenya 2-5 October 2001, was organised by the Institution of Surveyors of Kenya, the International Federation of Surveyors (FIG) and the UN-Habitat. In June 1999 the United Nations Economic Commission of Africa (UN-ECA) had its first meeting of the Committee on Development Information (CODI). A resolution from the sub-commission on Geo-Informatics recommended FIG, ICA, ISPRS and UN-ECA in co-operation to hold seminars in 2000-2001 in Anglophone and in Francophone Africa. In October 1999 FIG Commission 3, Spatial Information Management, decided to fulfil the CODI-resolution by having its annual meeting and a seminar/conference in an Anglophone African country in 2001. The conference became a reality because of support and help from the main sponsors United Nations Environmental Program (UNEP), GEOMAPS and Institution of Quantity Surveyors of Kenya, the co-sponsors Metrocosmo Valuers Ltd, University of Nairobi, Intergraph Mapping and GIS Solutions, Swedesurvey AB and a number of companies and institutions who have contributed in one way or another. In addition the United Nations Economic Commission for Africa and United Nations Food and Agriculture Organization were active participants. Development is the managed process of change designed to improve the conditions of members of a society. Sustainable Development implies that this process should balance the exploitation of resources, the direction of investments and the advancement of technology in a manner that affords the same opportunity to future generations. meets the need of the present without sacrificing the ability of future generations to meet their own needs', and Sustainable Development is 'development that meets the needs of the present without compromising the ability of future generations to meet their own needs (Brundtland 1992, 87). The theme of the conference was strongly related to the international community's efforts to advance the implementation of the Habitat Agenda (paragraphs 76 and 114) as well as the implementation of important elements of Chapters 7,10 and 40 of the Agenda 21. To develop and support improved and integrated land management, Governments at the appropriate levels, including local authorities, should: Develop integrated land information and mapping systems. 40.1. In Sustainable Development, everyone is a user and provider of information considered in the broad sense. That includes data, information, appropriately packaged experience and knowledge. The need for information arises at all levels, from that of senior decision makers at the national and international levels to the grass-roots and individual levels. 40.2. While considerable data already exist, …., more and different types of data need to be collected, at the local, provincial, national and international levels, indicating the status and trends of the planet's ecosystem, natural resource, pollution and socio-economic variables. The gap in the availability, quality, coherence, standardization and accessibility of data between the developed and the developing world has been increasing, seriously impairing the capacities of countries to make informed decisions concerning environment and development. 40.3. There is a general lack of capacity, particularly in developing countries, and in many areas at the international level, for the collection and assessment of data, for their transformation into useful information and for their dissemination. 40.5. …To develop or strengthen local, provincial, national and international means of ensuring that planning for Sustainable Development in all sectors is based on timely, reliable and usable information and to make relevant information accessible in the form and at the time required to facilitate its use. 40.9. Relevant international organizations should develop practical recommendations for coordinated, harmonized collection and assessment of data at the national and international levels. ………..
40.17. There already exists a wealth of data and information that could be used for the management of Sustainable Development. Finding the appropriate information at the required time and at the relevant scale of aggregation is a difficult task. 40.18. Information within many countries is not adequately managed, because of shortages of financial resources and trained manpower, lack of awareness of the value and availability of such information and other immediate or pressing problems, especially in developing countries. Even where information is available, it may not be easily accessible, either because of the lack of technology for effective access or because of associated costs, especially for information held outside the country and available commercially. Planning and implementation of Sustainable Development means that decision-makers on all levels in the public as well as the private sector should be able to evaluate risks and consequences of the possible solutions and scenarios. This demands the ability to access to all relevant information and subsequently the possibility to transform the available data into useful information. The relevant data and information need to be up-to-date, reliable and usable. Promotion of Sustainable Development demands overview, experience and knowledge that can be related to events (what has happened and what will happen? ), those involved (who was in involved or who will be affected? ), time (when did it happen and when will it happen?) and a location (where did it or will it happen?). In general "events" and "those involved" can be linked directly or indirectly to a specific geographic location. The location is the "main key" to data and information that is a condition for planning, development, implementation and administration of Sustainable Development. "A new wave of technological innovation is allowing us to capture, store, process and display an unprecedented amount of information about our planet and a wide variety of environmental and cultural phenomena. Much of this information will be "geo-referenced" - that is, it will refer to some specific place on the Earth's surface. The hard part of taking advantage of this flood of geo-spatial information will be making sense of it, -turning raw data into understandable information" /1/. With Geographic Information System (GIS) it becomes possible to integrate, analyze, model and visualize spatial data from different sources on the local as well as the national and international level, provided that data from the different sources have common "keys". Spatial Data and Information have the spatial component as the common key. With GIS it becomes possible to create overview and knowledge in up to now unseen combinations. Spatial data is a resource on a par with employees, funds etc. Use of spatial information opens up the possibility to increase efficiency in the public and the private sector. Spatial Data is an indispensable part of the basic infrastructure in the individual country, in line with roads, hospitals, schools etc. Spatial Data is strategically important to decision makers at all levels. Users are aware that 'somebody' maintains the infrastructure, but do not regard this maintainer as an owner. Users it to always be available, even if there is a fee or other consideration for its use. Management of Spatial Data and Information is a key element in the processes which leads to users of Spatial Information having a better overview of both simple and complex problems and which give users the possibility to create comprehensible and thus acceptable solutions and/or compromises. Spatial Information Management is based on the idea that data, people, software and hardware interact, and that it is practicable to obtain synergy by co-ordinating changes and development. The concept covers different disciplines such as capture, storing, maintenance and upgrading of data and information, information technology, organisational issues and spatial data infrastructure. Spatial Information Management is a dynamic concept. It changes in line with the technological possibilities and the political and organisational developments in society in general. Spatial Information Management is also about human resources and organisational changes. Being involved in Spatial Information Management means to be in the focal-point between man and technology. Spatial Information Management becomes an important discipline in both developed and developing countries and in countries in transition. Spatial Information Management as well as Spatial Knowledge Management is a growth field for surveyors. Spatial Data or Information stored in traditional paper maps is static. Each map sheet represents a snapshot of selected objects at a given time, and "the owner" has an exclusive right to the map. In contrast a digital map or better a collection of spatial and spatial related data is dynamic with the time parameter as a part of the individual data collection. The variety of applications implies a need for co-operation between the primary user and other possible users on standards, common data models, object definitions, common identification, keys, availability, copyright, prizing models, etc. There is a need for a well-documented Spatial Data Infrastructure. In the early 1990's much attention was focused on Geographic Information Systems (GIS) as a basis for Land information Systems. Soon it became obvious that the pure technical approach had to be replaced by a more holistic approach comprising organisational, political and technical matters. The concept of Spatial Data Infrastructure became a reality. In 1990 the United States Federal Geographic Data Committee (FGDC) was established to promote the coordinated use, sharing, and dissemination of geospatial data on a national basis. 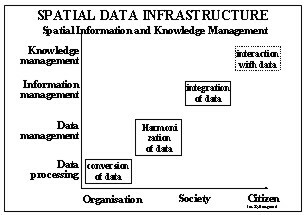 In 1997, at the second Global Spatial Data Infrastructure Conference, the first definition of Global Spatial Data Infrastructure (GSDI) was adopted. It was revised in May 2001. "The Global Spatial Data Infrastructure supports ready global access to geographic information. This is achieved through the coordinated actions of nations and organizations that promote awareness and implementation of complimentary policies, common standards and effective mechanisms for the development and availability of interoperable digital geographic data and technologies to support decision making at all scales for multiple purposes. These actions encompass the policies, organizational remits, data, technologies, standards, delivery mechanisms, and financial and human resources necessary to ensure that those working at the global and regional scale are not impeded in meeting their objectives"
The member associations behind FIG as well as the individual surveyors are involved in activities that are or will become important for Sustainable Development in the different regions of the world. Therefore FIG is constantly engaged in the issue. In 1999 the FIG Commission 7, in close cooperation with UN organisations and the World Bank held the workshop on "Land Tenure and Cadastral Infrastructures for Sustainable Development" in Australia. The outcome of the workshop is documented and published in "the Bathurst Declaration on Land Administration for Sustainable Development" /5/. The main findings call attention to the fact that promotion of Sustainable Development depends on demands for the formulation of a Spatial Data Infrastructure. The Bathurst Workshop addressed the changing relationship of humankind to land. The Workshop then considered the relationship of land with Sustainable Development, and the consequent relationship of land tenure to land administration. The Bathurst Declaration is primarily devoted to issues relevant for administration of land. The declaration calls attention to the need for Spatial Data and Information, and the need for a land information infrastructure. 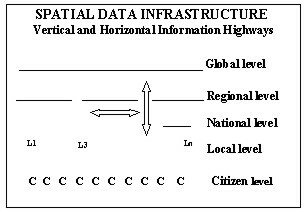 A land information infrastructure is a subset of a Spatial Data Infrastructure. … If relevant and good decisions are to be made by public authorities, private resource users or community bodies, they must be based on sound information about the land and environment in order to contribute to Sustainable Development. ……. Information technology will play an increasingly important role both in constructing the necessary infrastructure and in providing effective citizen access to information. Finally, there must be total commitment to the maintenance and upgrading of the land administration infrastructure. ……. Encourage the flow of information relating to land and property between different government agencies and between these agencies and the public. Whilst access to data, its collection, custody and updating should be facilitated at a local level, the overall land information infrastructure should be recognised as belonging to a national uniform service to promote sharing within and between nations. "Dealing with surveying, planning and management of land and water resources, laws and systems needed for access to land and security of tenure, and with geographic information in all its aspects, the surveying profession is deeply involved in issues of profound importance for Sustainable Development …"
FIG Agenda 21 gives examples and directions on how surveyors can contribute to implement and support Sustainable Development in all regions of the world. Chapter IV is dedicated to Spatial Information for Decision Making. After having underlined the importance of data as a basis for decision making, the attention is drawn to the fact that although data quite often exists, it is difficult to access and, is not standardized etc. Finally it is pointed out that the lack of infrastructure is a barrier for sharing, use and reuse of data. Good decisions for Sustainable Development depend on access to reliable and relevant information and to a very large extent on information that is geographically referenced. The need for geographic information arises at all levels of government, from senior decision-makers to the grass roots and individual levels. Considerable data exist, but access to data is often hampered by lack of standardisation, coherence and adequate services for data retrieval, including information about what data exist and where data are kept. The rapid development of technologies and methods in surveying and mapping, such as integrated geographic information systems, remote sensing, satellite positioning systems and digital networks for sharing and disseminating of data, provides a strong and important tool for decision making for Sustainable Development. Accessible and relevant geographic information will play an important role in planning, executing and monitoring development. Developing countries have embarked on implementing spatial infrastructures for the optimal sharing and use of geographic data in digital form. However, the majority of developing countries lack the capacity to utilise the emerging technologies and methods. 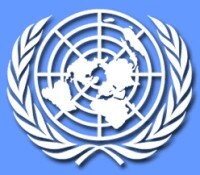 In 2001 the United Nations arranged two regional conferences addressing topics related to spatial information. The outcome of the Conferences is recommendations calling attention to the need for Spatial Data Infrastructure. "The concept and realization of the value of Spatial Data Infrastructure was increasing. There was increasing facilitation of access to a wide range of data, and the challenge was how to harness the capability. The barriers were not related to technology but, in order to restructure and focus on standards, various national mapping programs would be required…. In 2000, various governments in the Americas, in collaboration, created a Permanent Committee on Spatial Data Infrastructure of the Americas……"
Spatial Data Infrastructure is mentioned in most of the 10 resolutions adopted by the conference. Resolution no 7 is about "Implementation of National Spatial Data infrastructures in the Americas". That all countries of the Americas embrace the concept of national spatial data infrastructures and develop implementation strategies that support regional and global SDI initiatives while meeting national objects. The Development Services Division of UN-ECA had prepared a position paper: "The Future Orientation of Geoinformation Activities in Africa". The aim of the paper was "to raise awareness of African governments on the importance of geographic information." It was established early in the paper that the future orientation of GIS does not lie in the technology itself, but in its use to process data to support spatial decisions and services. Experience in some African countries suggests that emphasis on the technology might result in the acquisition of hardware, software and peripherals with no clear plans on how to use them. Others might go a step further and use the technology to digitise maps and simply automate map productions, creating large digital databases, which would be locked away for departmental use, with all the flaws of the present manual systems. The paper, strongly recommended to all interested in Spatial Data and Information, became endorsed by the meeting. facilitate the establishment of RSDI and the African Regional Database. The permanent committee should follow the model of the Permanent Committees for the Americas (PC-IDEA) and for Asia and Pacific. Further investigation be done on the regulatory conditions under which NMA's are eligible for competitive valued-added production and on the concept of cost recovery in various accounting and financial regime. In 1998 the field of responsibility for Commission 3 was changed from Land Information System and GIS to Spatial Information Management. To day the term Spatial Information Management (or Geographic Information Management) has been adopted by several involved in the traditional GIS businesses. Management of Spatial Information supporting Sustainable Development. "Towards a digital earth" - How to change raw data into understandable information. WG 3.3: Facilitating Spatial Information and Knowledge Management for decision support: through appropriate organisational, political, business structure. At working weeks, annual meetings and seminars the Commission offer people from different countries the possibility: to share experiences, to become members of a global network and to become friends. The results of the Working Groups and the meetings are made available to the professional and political community in the form of reports and proceedings. Information on the Commission and its activities and results is available on the Commission homepage on http://fig3.boku.at.